This is one of my favorite cards in the Tarot. This card represents a deep connection with intuition, subconscious processes, and the moon. She seems to be a deeply spiritual woman led by her intuitive guidance. This could be related to psychic ability and paying more attention to the inner world. This card tells us that less attention needs to be put on the outer world and more attention on inner and the subconscious world. This card could be telling you to listen to your dreams, spending time at night in meditation, or using hypnosis to interact with the subconscious mind. She is in tune with the cycles of the moon. For example setting goals during the new moon and watching them grow and manifest as the moon gets fuller in its beauty. Dormant abilities like chnaelling and mediumistic tendencies might be awakened. The need for more reading of spiritual texts and seeking spiritual guidance from within. The High Priestess is the guardian of the unconscious. She sits in front of the thin veil of awareness, which is all that separates us from our inner selves. She represents spiritual enlightenment and inner illumination, divine knowledge and wisdom. She has a deep, intuitive understanding of the Universe and uses this knowledge to teach rather than to try to control others. She appears in a Tarot reading when there is a need to listen to and trust your inner voice. The High Priestess Tarot card represents a link to the subconscious mind, which cannot be accessed through the everyday world but only through dreams and symbols. This card tells you to put aside a time when you can meditate and listen to your own inner voice. Your intuitive sense right now is providing you with useful and helpful information and is assisting you to become more in touch with your subconscious mind. The High Priestess indicates that your intuitive powers are increasing and you may be inspired to be creative. Hope everyone is having a great summer! I was on vacation in Europe over the summer and wasn’t able to blog consistently. I will be blogging every two weeks about a Tarot card. I am still doing the summer special until September. Please contact me for more information. Many Blessings! The Magician works on channeling energy from The Source into manifestation on the earthly plane. This can be done through meditation and quieting the mind in order to listen to inner guidance. It is having the divine and creative spark begin to ignite within us and then having the faith to manifest it. The Magician taps into the abundance from higher realms and uses the energy to create abundance on earth. He uses a cup for the water element, wand for fire, sword for air, and pentacle for earth. By tapping into these elements we can manifest our goals to create emotional stability, focus of mind, creativity and inspiration, and material wealth and abundance. The Magician opens us up to our unlimited potential and helps remember the magic that we can create in our lives. 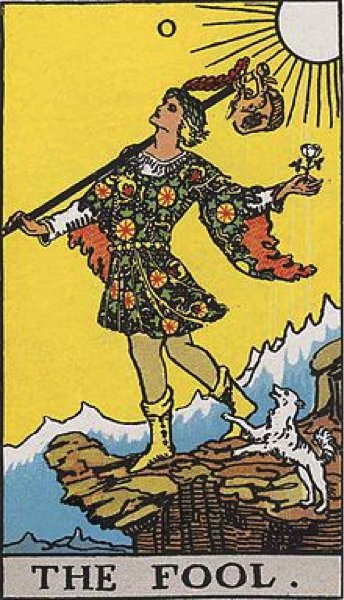 The Magician is associated with the planet, Mercury and carries with it skill, logic, and intellect. The Magician is numbered one, the number of new beginnings. The Magician is the bridge between the world of the spirit and the world of humanity. His right hand holds a staff raised toward the sky and his left hand points to the earth. He takes the power of the Universe and channels it through his own body and directs it to the physical plane. There are two symbols of eternity displayed in this card. The first is the figure eight above his head and the second is the snake biting its tail. The Magician card appears in a reading at a time in your life when you have the creative power to create a new life cycle for yourself. You have the ability to take the power of the Universe and manifest your dreams!. The Magician card suggests that a situation has been or will be presented to you that will allow the manifestation of your desires. Those desires may be spiritual (fire), physical (earth), emotional (water), or mental (air), and are each aligned with the four elements of the Tarot. With the Magician card, you are inspired to apply skill and initiative to accomplish all your goals. 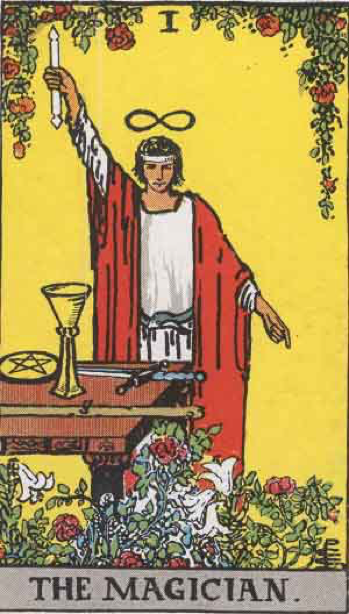 The Magician is also a card of intent and focus on a specific task or activity. You need to be focused on a single goal or purpose to channel all of your energy, tools and resources towards this one goal. Commitment to the task is essential and you will need to eliminate any distractions that will take your focus away from what you want to achieve.